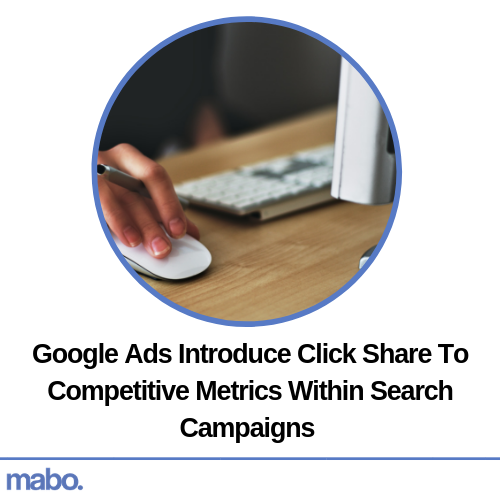 Google has introduced the click share metric to Search campaigns in order to help advertisers get a well-rounded understanding of how their text ads are performing. It’s arguable that Google have made this change to combat the average position metric becoming less useful. The click share metric indicates to advertisers how many clicks their ads have received out of the total number of times Google estimated your ads could have been clicked. This figure is reflected as a percentage, allowing advertisers to quickly identify how effective their ads actually are, and understand how your ads are engaging users in comparison to the competition. Google originally introduced this metric to Shopping campaigns a few years ago and have now made the decision to add it to Search campaigns. The search engine reveal that click share is a competitive metric that ultimately exists to give advertiser a deeper. More thorough understanding than average position is able to provide. This update can only be a good thing for advertisers and it provides them with greater information and further detail to inform decisions within their accounts.